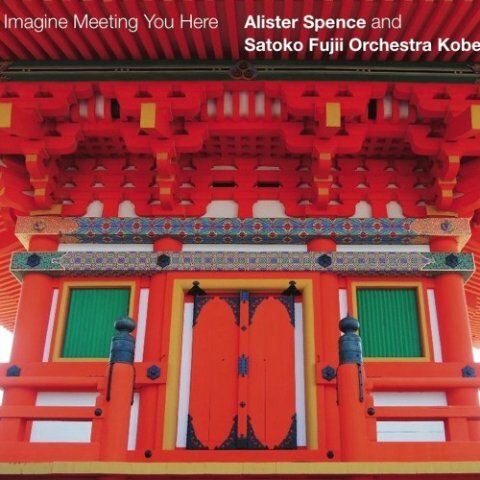 Imagine Meeting You Here (Alister Spence Music, 2019) is the latest release by Alister Spence, a recognized leader in Australia’s new music directive and one of his country’s most original and distinctive jazz pianists and composers of orchestral pieces. Certainly there is a reflection in the title of this release that is his journey and meeting in musical imagination. A project that developed in 2015 when Spence was beginning a doctoral PhD in creative practice(music composition)which morphed into a wonderful collaborative effort with the prolific and brilliant Japanese pianist-composer Satoko Fujii and her cutting-edge ensemble, Satoko Fujii Orchestra Kobe. Spence and Fujii first met in Sydney in 2007, which began a long and productive musical interaction involving performances together at the Tokyo International Jazz Festival(2008), and also playing duo and trio concerts in Australia, Japan and Berlin. “Part 1” shows-off Spence’s deft handling of melody and orchestration. Opening with a traditional Japanese flute instrument, shakuhachi, a peaceful call is heard, followed by a hypnotic drum beat, then rhythm rises, and tension finally builds to allow fiery solos from featured musicians Eiichiro Arasaki((tenor saxophone) Natsuki Tamura(trumpeter) Yasuhisa Mizutani(alto saxophone) and Takumi Seino(guitarist). “Part 2” is a break entirely from a regular rhythm and beat with an onslaught of nonsense vocalizing that is chant-like, driving a chaos that transitions to almost “beat” generation be-bop attitude with blaring horns, as Spence lays out a rowdy score in odd-meter 5/4 beat with collective wild improvisation. “Part 3” is an invention of sounds in interplay, keeping the listener off-guard, as squeaks, mysterious bird calls, timbre clicks, trumpet vocalizations and whining strings play behind an initially sustained moaning horn, achieving a suspense of a soundscape taking its own improvisational a-tonal “cross in the road.” “Part 4” is a wild ride, beginning with soft bass line to a propulsion of drum beat, then suddenly over-ridden by wailing improvisations by trumpeter Rabito Arimoto and tenor saxophonist Tsutomu Takei. Mid-way, a full ensemble, take-no prisoners, counter-melody is driven by horn section, re-grouping with a melody big-band sound. “Part 4” treats the listener to a multi-movement roller-coaster. Accomplishing so much variety in instrumental range, timbre, rhythm, melody with an open door for improvisation, Spence and the Satoko Fujii Orchestra Kobe deliver a wonderfully imaginative and creative listening adventure, that is refreshing to the ears. Spence’s Imagine Meeting YouHere abounds with surprises, providing a see-saw of disciplined, wild and inventive changes in each composition, allowing for un-conventional use of instrumentation and inventive, boundary-less interpretation.